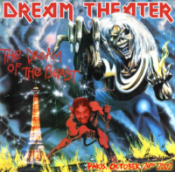 Dream Theater played The Number of the Beast by Iron Maiden as their classic album in the UK and France second night shows. We are working on getting some/all of the tracks and will keep you posted. Also, of note, is that they played Gangland twice at the France show and mentioned that they were recording the show. Also, at the France show, Dream Theater played Your Majesty for the first time in 16 years. A recording of this is available on Downloads Page.